Take a trip to ancient China and revel in the spectacle of the far-eastern culture. As far as slot online go, this 5 reel enables you to uncover Chinese symbols, lanterns, and gongs and capture some wise floating Wild bonuses. This amazing game is designed and conceived by NetEnt, a pioneering company in the industry of digital and casino gaming, providing game-ware to all of the greatest casinos in the world. Games just like Lights is what made them famous and keeps them up in the tops, as they have been there for 20 years and counting. Starting from the bottom as they designed their first game with only 3 employees, they have reached the point of having 1000+ employees in the team, all of them working for you to enjoy the winning feeling. It was all designed for you, all these stunning graphics, and this serene Asian village atmosphere that lets you concentrate on nothing but winning. Sit back, relax and go on spinning with Lights online slot game by NetEnt. There are many more NetEnt games available for you to try, Learn how to pay by mobile casino. Tired of all the stress of monotony and day-by-day living? Had enough of those fast-paced, action-packed slot games that eat your brains out, not giving a single second to relax, distracting you with glittery, shaking, rolling, swiping graphic elements acting all-over your screen? Well, this one is for you! Time to zen yourself out! Relax, take a deep breath and get ready to meditate. Everything about this game is made for your state of mind to chill and start daydreaming. 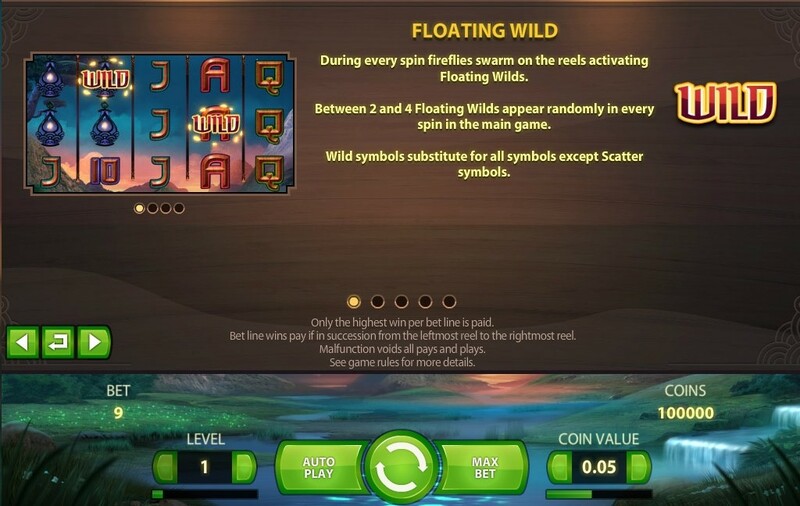 This 5-reels, 9 pay-lines slot game’s elements tend to glide rather than bouncing, the graphics being in perfect harmony with the soundtrack, together delivering a Zen and relaxing atmosphere, helped by all the little details acting on the background, from the firefly lights to the gently glowing green moss or the silently whistling streaming waterfall. All this atmosphere is there for you to engage with, and feel good watching the whole landscape and get into a meditative state under the moonlight that is watching over the whole scenery of this Asiatic mountain village. Light some aromatherapy sticks, plug your earphone and you’re good to go! Make sure you won’t fall asleep as this game carries you to the most beautiful of your dreams, that of becoming reach overnight. 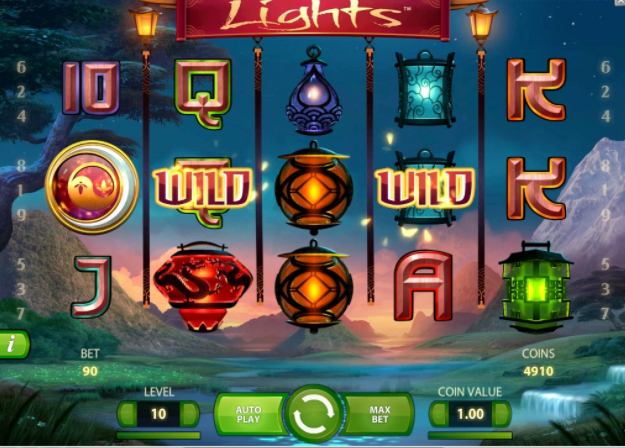 Don’t dream it, make it with Lights slot machine from NetEnt. This game is so relaxing that not even the soundtrack drums that start beating to build up excitement, or the “Big Win” jingle will be strong enough to wake you up. Join today and play online slot games. The reels are simple, containing symbols such as yin-yang moons, Asian numbers, or phosphorescent lanterns. This is not all, as the meditation state of yours reaches new levels of profound relaxation, you are also in for some bonuses with this one. Land on at least 3 scatter signs and you can get up to 30 free spins, or more when entering the free spins no deposit mode of the game. There are wilds as well, as fireflies intermittently shine randomly across the reels to get you between 2 and 4 wilds. The wilds substitute every single symbol apart from scatters. Get yourself illuminated by meditating! Land on 5 red lanterns during an active pay-line and get yourself a whooping 1000 credits jackpot. Never felt so good playing a slot machine game. Probably the most serene title of the casino gaming market right now, but surely the most relaxing game ever produced by NetEnt. Another great game to try, visit Easy Slots now!